November is the time for Call of Duty, and tomorrow is the official release date of Black Ops 2 - one of the most expected autumn games. 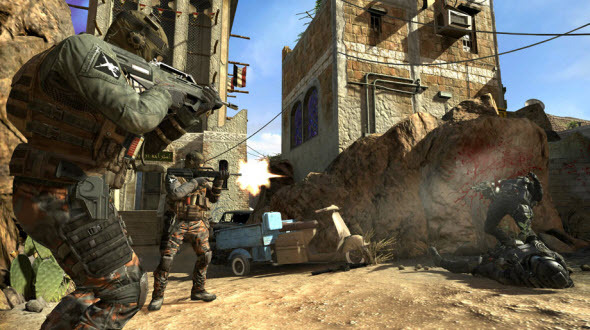 From year to year the developers are trying to add new features in their old shooter, and each year it gathers lot of fans. Will the game of this year be successful as always? Let's try to find out. 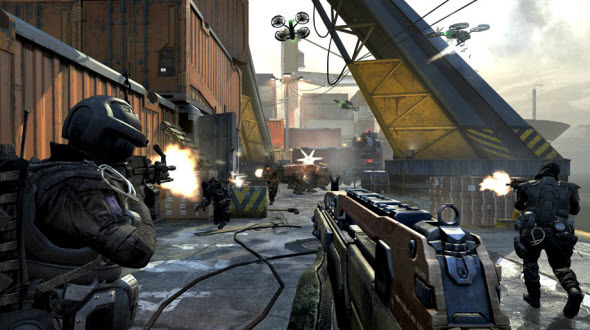 Call of Duty: Black Ops 2 is a sequel to the game of year 2010, and its plot covers two spaces of time. First storyline starts just after the events of the first part of the game. 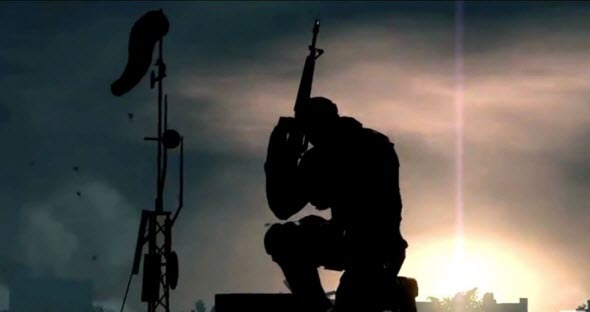 Here you will be playing for Alex again, and the developers also promised to reveal some details about the original game in the new part. Did Alex kill Kennedy and what happened next? 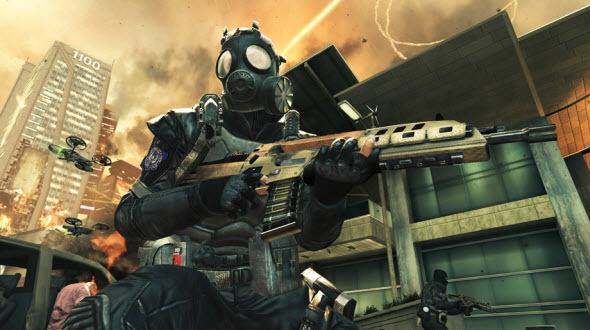 Be ready to find out the answers in Call of Duty: Black Ops 2 game. The other part of game's scenario takes place in the nearest future. Here you are David - the son of Alex, that is fighting for humanity in 2025. 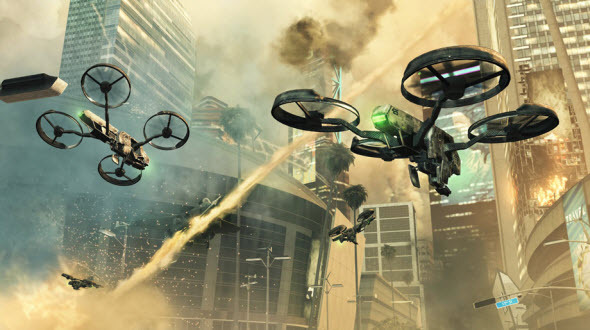 In future USA the technologies made a huge leap, so now we have a lot of different weapons and warlike robots. But artificial intellect is not going to obey people anymore, and robots upraise insurrection. 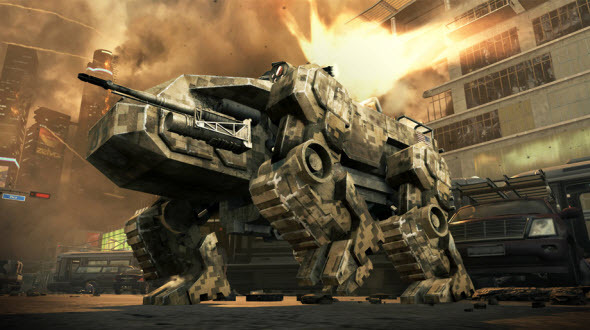 You will need to fight against gory machines, using the magnificent arsenal of future warrior. It is humorous that all this outrage occurs while the president of USA is a woman. By the way, versatile and tangled scenario of the game was written by David S. Goyer - the script writer of Batman Begins and The Dark Knight. As we already mentioned, the weapon in the game is very futuristic and dangerous. Together with usual guns, you will be able to use original and effective rear sight, obstruct the road of your opponents with microwave radiation and even control your own robot. The robot is the most impressive and useful weapon, so we are sure that you will want to try it in the game. It is interesting, that robots have an artificial intelligence, so it can be managed by itself. But any time you need its help - just use the control board and destroy your enemies with their weapon. As always, you will be able to use a lot of different types of weapon or attachments. By default there are ten slots for various items, but during the game you will be able to expand the number of slots. After each level you are getting a score, and you can use it to add new slot, new weapon, new item or to improve some weapon or characteristic. Be careful, you have only one score, so it is important to find the right strategy of boosting your hero from the first level. If you want to play with real people, you will need good characteristics, so before starting the multiplayer mode, train your hero. You can play in multiplayer mode with bots until you get the tenth level, but then you will be getting only the half of the possible experience. So, the developers tried to make the game pleasant for everyone from old-school and experienced fans to novices. By the way, if you are new to the game you can start from observation. In Call of Duty: Black Ops 2 we will get an interesting feature called CODcaster that allows every gamer to broadcast his gaming process. In the new Call of Duty you will be able to save the part of the battle and post via Internet to show your achievements to friends. And when you are finally ready for the real battle, you can choose one of two brand-new multiplayer modes, that are available in the game. In Hardpoint mode you and your team will be trying to hold on specified area as long, as possible, repulsing the enemies' assault. 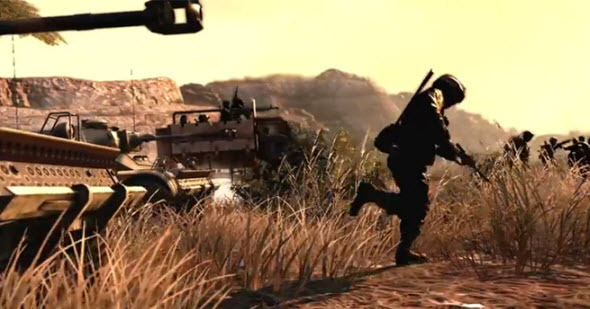 In Multi-team mode you will be fighting together with allies against 5 other teams. The developers didn't change the graphical engine in the game, but they updated it industriously. So the picture became very realistic and cinematographic, and the combination of lights and darks will definitely amaze you. But the destruction, as before, looks poor and unrealistic. Lot of people berate Call of Duty series because from year to year it stays almost immutable. But nevertheless we all are waiting for the new game and hope that it will be as enjoyable, as the first parts of this series. 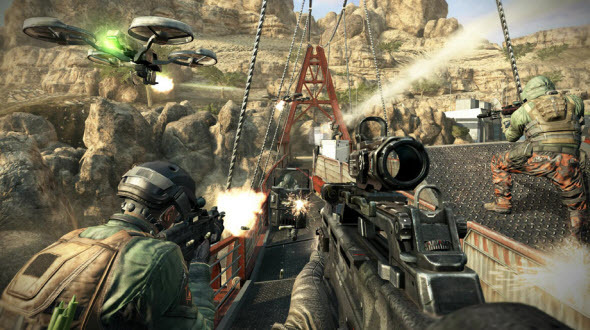 So let's keep our fingers crossed once more - Call of Duty: Black Ops 2 has a potential to become really successful.